Researchers have developed a new hydrogen storage system for cars that makes it possible to fill up a vehicle's fuel tank with enough hydrogen to drive 300 miles, in just five minutes. 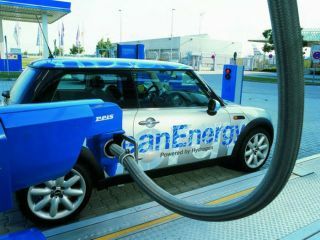 Storing hydrogen quickly and safely is one of the major obstacles to developing practical electric cars running on hydrogen fuel cells. Absorbing the volatile hydrogen gas within a metal hydride power at high pressure is safe but generates dangerously large quantities of heat. "It would take a minimum of 40 minutes to fill the tank without cooling," says Professor Issam Mudawar, who lead the research. "That would be entirely impractical." His researchers have created a new heat exchanger that circulates coolant through tubes and uses fins to remove heat generated as the hydrogen is absorbed by the powder. The heat exchanger, which is made mostly of aluminum, contains a network of thin fins that provide an efficient cooling path between the metal hydride and the coolant. "This milestone paves the way for practical on-board hydrogen storage systems that can be charged multiple times in much the same way a gasoline tank is charged today," said a researcher at GM's Chemical & Environmental Sciences Laboratory. "As newer and better metal hydrides are developed by research teams worldwide, the heat exchanger design will provide a ready solution for the automobile industry."